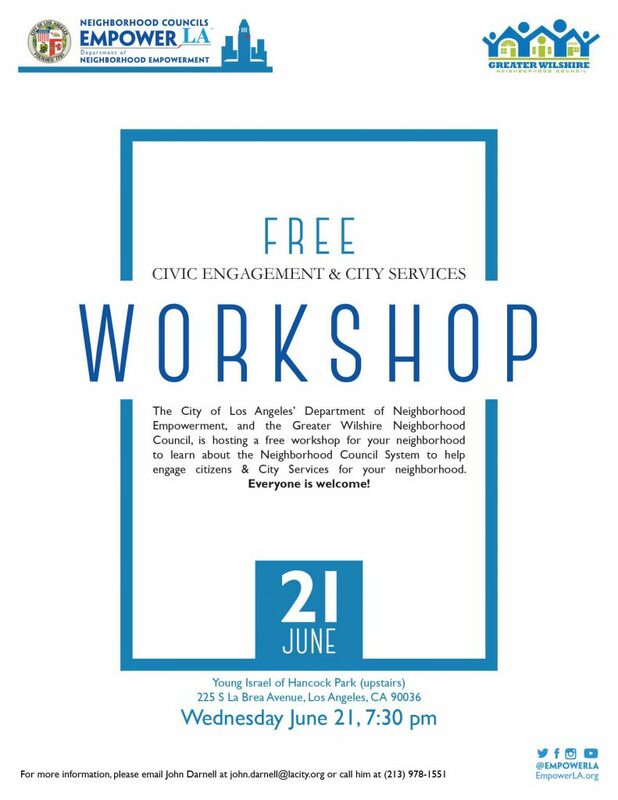 The Greater Wilshire Neighborhood Council and the Department of Neighborhood Empowerment are hosting a FREE workshop on civic engagement and city services for your neighborhood. 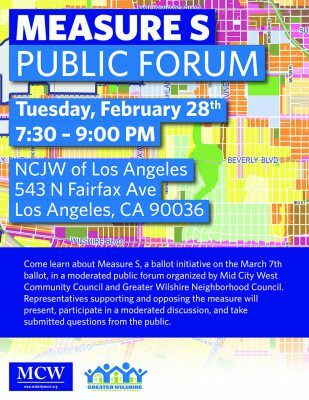 Guest speakers from the neighborhood council will attend and be available for questions, and John Darnell (Department of Neighborhood Empowerment, formerly with the office of Councilmember Paul Koretz) will give a presentation on DONE and city services. The due date for all NPG applications is Friday, May 19, 2017, 5:00 p.m. (PST) . Please also note that all NPG applications received after the Friday, May 20, 2017, 5:00 p.m., deadline will be considered for the 2017-2018 Neighborhood Purposes Grant awards. Deadline for the 2017-2018 NPG applications to be announced shortly. In order to be considered for the 2016-2017 GWNC NPG Awards, the project start date and the date the funds are required for the project (items 10(a) and 10(b) in the NPG Application) must be no later than June 30, 2017. All applications with a start date and a date funds required after June 30, 2017, will be considered for the 2017-2018 GWNC NPG Awards. 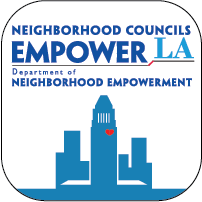 The Greater Wilshire Neighborhood Council is currently accepting applications for 2017 Neighborhood Purposes Grants (NPG). Two neighborhood purposes grants up to $1,000 each will be available. Neighborhood Purposes Grants can be used by either certified 501(c)(3) nonprofit organizations or public schools for community improvement projects. Applications are due Friday, June 02, 2017, by 5:00 p.m. (PST). Interested organizations should seek to apply as soon as possible. For more information, guidelines, and official application forms, visit our Neighborhood Purposes Grant page. 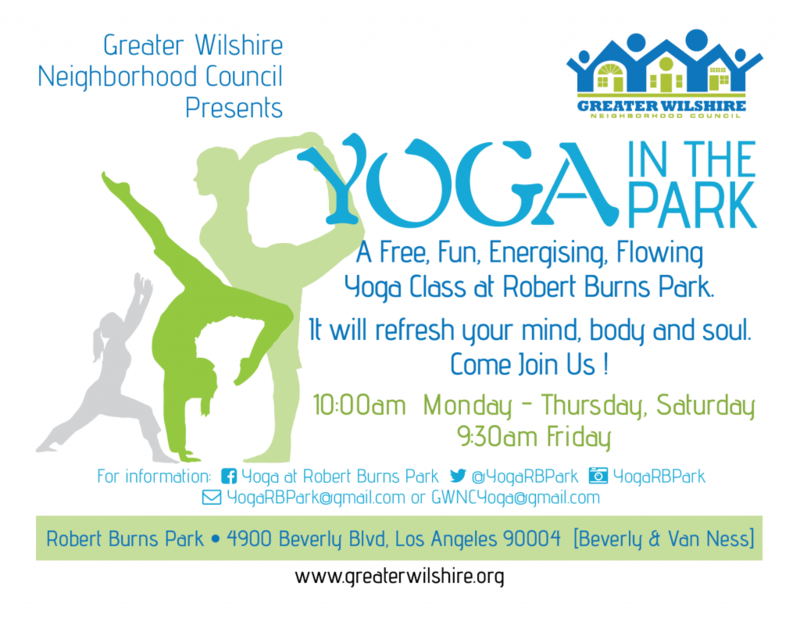 Have you joined us for Yoga in Robert Burns Park? 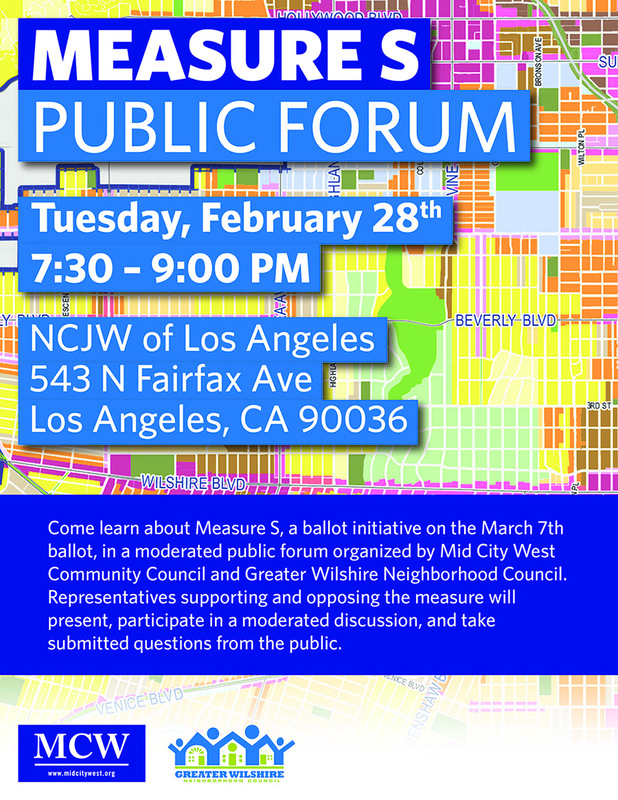 Learn about Measure S, an initiative on the March 7th ballot that could have wide-ranging effects on many types of development and housing in Los Angeles, in a moderated public forum organized by Mid City West Community Council and the Greater Wilshire Neighborhood Council. Representatives supporting and opposing the measure will present, participate in a moderated discussion, and take submitted questions from the public. Greg Goldin is an architectural historian specializing in the story of unbuilt urban and design schemes. He is the author of Never Built Los Angeles and its sequel Never Built New York. He has been a Los Angeles-based journalist for more than 30 years, covering local politics, urban affairs, and the environment. Luke Klipp is the President of the Los Feliz Neighborhood Council, and he spends his days crunching numbers for the LA Metro. At the neighborhood council, he’s also served on the Transportation and Planning committees. He and his husband own their Los Feliz home, where their two dogs run the show. Jack Humphreville is the Greater Wilshire Neighborhood Council Budget and DWP Representative, a Neighborhood Council Budget Advocate, the chair of the DWP Advocacy Committee, and a contributor to CityWatch where he writes about Department of Water and Power and the City of Los Angeles and their finances. Want to learn more about our local neighborhood history? On Sunday, December 11, please join the Sycamore Square Neighborhood Association for a free, informal, one-hour walking tour of the Sycamore Square neighborhood (bordered by Wilshire, Citrus, Olympic, and La Brea). The theme of the tour is “Yesterday, Today and Tomorrow.” We’ll trace the neighborhood’s origins, history, and development (including its unique residential zoning pattern that fosters a multiplicity of generations and lifestyles)…as well as introduce current neighborhood issues and preservation efforts. The event is open to everyone; no advance reservations required. Just meet at 2 p.m. at the NE corner of Sycamore and Olympic (the corner of the front lawn of Wilshire Crest School) to explore this historic, well-preserved, wonderfully diverse and livable community. (The tour will take about an hour, and is an easy, level walk.) Please join us if you can! Join Team GWNC for AIDS Walk Los Angeles! The Greater Wilshire Neighborhood Council is participating in this year’s AIDS Walk Los Angeles, a 10K fundraising walk to fight the epidemic. Oct. 12, 2016 at noon is the last chance to qualify for a team “spot in the park.” Register today! Where: Coming this fall to Grand Park in Downtown Los Angeles! 10 a.m. AIDS Walk Los Angeles Begins! What: AIDS Walk Los Angeles is a 10-kilometer (6.2-mile) fundraising walk to fight HIV/AIDS, and usually takes about 2.5 hours to complete. Register today to join us for an inspiring and memorable day! The October 12th meeting of the GWNC Board has been moved one week to Wednesday, October 19th at 7pm due to the Yom Kippur holiday. Save the Date for LAPD Wilshire Division’s annual Open House Event! 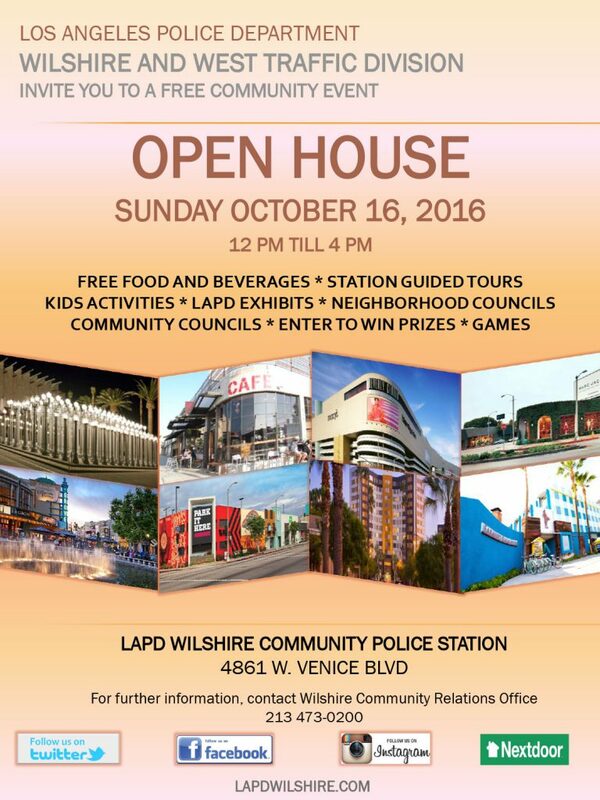 On Sunday October 16, 2016 from 12pm till 4pm Wilshire station, along with West Traffic Division, will open its doors to the community with activities for the kids as well as for the adults.